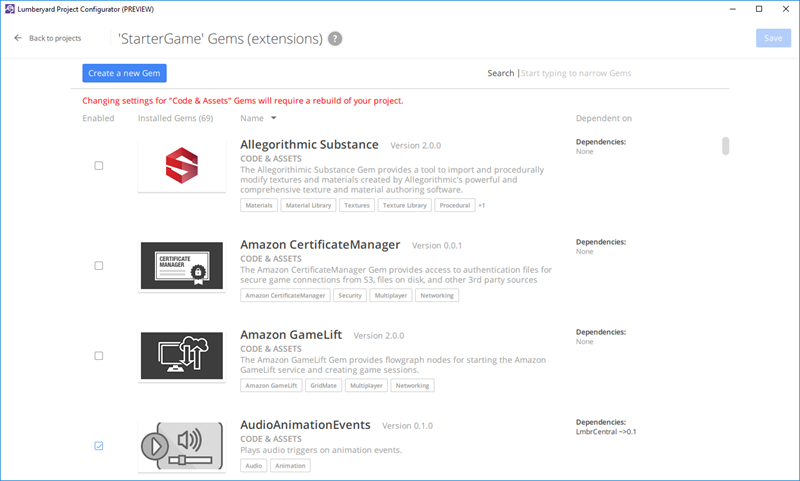 You can enable gems using the Project Configurator or from a command line. To enable a gem from a command line, see Gems Commands. In the Project Configurator, select your active game project and choose Set as default. Select the gems that you want to enable. If you enabled gems labeled CODE & ASSETS, you must build your game project to make the gems available in Lumberyard Editor. If you enabled only gems labeled ASSETS ONLY, you do not need to build your game project before opening it in Lumberyard Editor. For more information, see Building Your Game Project.